Ranunculus is best known as the buttercup flower to those who garden. There are over 1,000 species available in this family of flowers. This creates a number of available species for a garden or container. These are often used to help edge a walkway in lawns or garden bed. They are also popular for patio container and window box gardening. Blooms are often cut and used for vases and cut flower arrangements. Meadow buttercup, R. acris, is named for the acrid poison it contains. This poison is in place to prevent herbivores from eating the blooms. Petals are often yellow and have a tendency to bend downward on stems. This species is often found growing near water, especially streams. For this reason it is often planted near ponds and garden streams. It may also be placed near fountains or in a pool side garden pot. R. septentrionalis is often called the Swamp or Marsh Buttercup. This perennial grows up to six inches tall with small yellow flowers. The leaves are hairless and have a dark green appearance near ground. This species is commonly found near swamps, damp logs or wet areas. Soggy areas of wetlands are another good grow location for plants. These are an ideal plant for areas of lawns that tend to flood often. R. abortivus has more rounded leaves than the other common species. The basal leaves are often a deeper green and may appear hairless. Cauline leaves may also be present in some varieties of the species. These flowers are considered to be the sign that spring is arriving. They are among the first of the spring flowers to begin to bloom. The petals are slightly less full than other species in this family. For garden hybrids, well drained soil is often preferred for plants. Soil that remains puddled for hours after watering may cause decay. 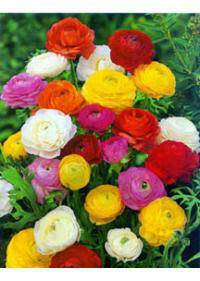 Those using Ranunculus that are closer to wild, damp soil is ideal. Peat moss and compost are often used to increase the soil quality. Decomposed manure or other additives may also be added for nutrients. A layer of two to three inches is often enough to increase drainage. Bulbs should be planted two inches deep and up to four inches apart. This will give them adequate room to grow and spread during seasons. If overcrowding occurs they may need to be dug up and thinned out. Foliage should not be cut back after the blooms have been spent. Regular watering should continue until the plant begins to go dormant. This will allow them to produce better roots for the following year. Full sun is the best for both garden beds and container growing. Smaller pots can be moved in order to give them enough sunlight. Partial sun may be used for some species that are more tolerant. Ranunculus is a flower that contains very many vibrant colors. They are especially sold across Los Angeles, CA, Cambridge, MA, Clearwater, FL, Alexandria, VA, and Federal Way, WA but can also be found and delivered elsewhere. One should be wary that different coloration can have different meanings. The most popular meaning for buttercups is one of being dazzled. It is thought that the blooms are captivating and dazzle the eyes. They are ideal for a new love interest or for someone highly admired. Colors range from yellow to red and orange, opening up more meanings. Pairing them with other flowers can also change meaning and intent. This makes ranunculus blooms a good choice for many arrangements.